Can prosecco ever be hangover-free? The promise of a hangover-free tipple will have many of us reaching for the bubbles to celebrate. But wouldn't that be too good to be true? With party season approaching, budget supermarket Lidl has hinted that its new organic prosecco might bring drinkers a step closer to a night out without the banging headache the morning after. The media have seized on it, splashing a "hangover-free" claim across their titles. The reality, though, is a little more nuanced. Richard Bampfield, master of wine at Lidl, explains that organic wine producers use a lower level of sulphites in the production process, which means they are less likely to contribute to hangovers. "If you don't react well to sulphites, you could be saying good riddance to hangovers with Lidl's organic Prosecco Spumante," he says. But is it the sulphites or something else that's causing the hangover? Mark Leyshon, from Alcohol Concern, says there's no such thing as a hangover-free alcoholic drink. "It's not always the most fun answer but that's the science," he tells the BBC. "The only way to avoid one is to drink less." He acknowledges that organic wine probably does contain fewer sulphites, namely sulphur dioxide. As such, there's a possibility that a small number who are sensitive to sulphites are less likely to get a headache but that won't be the case for the majority, he says. Sulphur dioxide, which is produced naturally in wine-making, is generally considered harmless. It is commonly used as a preservative in foods, including dried apricots and other dried fruits. A few people, such as severe asthma sufferers, can be sensitive to it which is why wines containing more than a certain amount must display a warning on their label. But, despite that, it seems there's no getting away from it - the main cause of a hangover is alcohol. Dr Nick Knight, a GP registrar, says a hangover is "a complicated business" for which there is no known cure. "It's caused by dehydration. Alcohol is a diuretic meaning it makes you go to the toilet more, you drink less water and eat less. "When you wake up the next morning, your sugar levels are low and you feel exhausted." The British Medical Journal (BMJ) says there's no effective way to treat or prevent a hangover, he adds. Nevertheless, Dr Knight advises drinking a pint of water before bed and eating a big meal the day after to potentially mitigate the effects. If you have any ongoing concerns, visit your GP. Mark, from Alcohol Concern, adds: "Even if you are drinking prosecco with fewer sulphites - if you drink enough of it, it will make you feel ill.
"Alcohol is not an ordinary commodity - it's a toxic chemical, regardless of whether it's organic or not. "It will make you ill in the short term and over the long term can give you health problems." Prosecco is lower in alcohol than other sparkling wines, at about 11 or 12%. 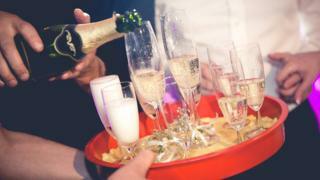 Men and women are advised by the NHS not to regularly drink more than 14 units a week. That's the equivalent of 10 small glasses of prosecco.